FORT LEONARD WOOD, Mo. (Oct. 27, 2015) — Fort Leonard Wood’s hospital commander, Col. Pete Nielsen, wants soldiers to have better experiences with Army medicine starting with their first days in uniform during basic training. A new program, the first-ever to be established at a TRADOC basic training post, is intended to ensure “that impression (of Army medicine) be professional, coordinated, and optimize their ability to get back to training so they can be medically ready… to be assigned to a unit anywhere,” Nielsen said. Changes in Army prescription policies for maintenance medications, those which are taken regularly by a servicemember, dependent, retiree, or retiree family member as opposed to medicine needed to treat new conditions, will require TRICARE beneficiaries to use military pharmacies either in person or via mail. There will be only two opportunities to refill a maintenance medication at a commercial pharmacy, he said. Requiring those using TRICARE to use military pharmacies will save money for the Department of Defense, Nielsen said, and in the long run that should help beneficiaries. 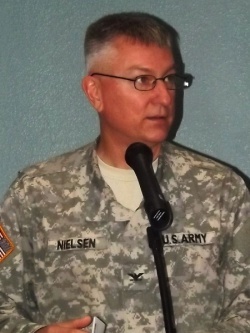 Nielsen encouraged servicemembers and others able to donate blood to consider making a donation tomorrow through the Armed Services blood program, which sends blood directly to soldiers in Afghanistan. Tomorrow’s blood donation event will be from 9 to 1 p.m. at Stonegate Community Center on 235 Ellis Street. In other matters related to General Leonard Wood Army Community Hospital, Red Cross hospital volunteer chairman Mary Stewart noted that a dental assistant training program has an Oct. 30 deadline for applications, with interviews on Nov. 4 and the program starting Jan. 19. “This is a really valuable opportunity for dental trainees but you must be willing to commit to seven months of training and a thousand hours,” Stewart said. The Red Cross chapter is also continuing its first aid program with the next training date on Nov. 7. Red Cross blood drivers are also coming to the area in November, she said.